Ukrainian athletes continue to conquer the international sports arena of the “European IBJJF Jiu-Jitsu Championship”. Yaroslav Blazhko has won the bronze medal at the championship in the category of purple belts, adult! 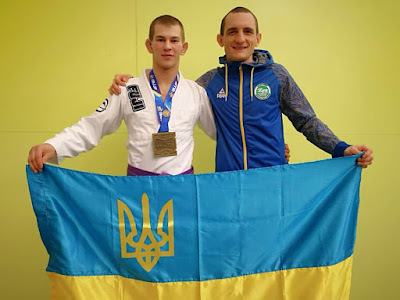 For the second year in a row, Yaroslav took bronze in his category at the European Championship. According to Ievgen Skyrda, the head coach of the SC “Borets”, even despite the fact that sportsman won bronze, it was one of the best performances! Blazhko fought like a true professional and confidently defeated 4 opponents. Only in the semifinal fighter lost to the champion of the category. In turn, Roman Nepota also has honorably represented his country. However, he lost in the second fight to the champion of the category. The coach explained that Roman’s main goal was to get as much experience as possible. This young athlete has just recently got in the category of purple belts and is only being mastered in the new status. Ievgen Skyrda also added that this championship impressed him with the high level of athletes. He also noticed that with each year Jiu-Jitsu has been developing faster and faster in Ukraine. And soon the world of the professional BJJ will hear names of Ukrainian fighters!